How to import a rigged Mesh to SL, OpenSim or similar online worlds. How to use image textures to texturise your character. This video has been made in SL. But it applies also OpenSim or any other OpenSim based world as well. Also the video does not depend on Blender, but it is a general purpose tutorial for the SL Importer. Below you find the import procedure explained in pictures. Hint: Did you know that Linden Lab provides another world very similar to Second Life, where you can upload your meshes for free? The Beta Grid is a perfect way to test your mesh creations before you finally upload them to Second Life. You can start an upload directly from the main menu bar as shown in the image above.You also can start an upload from within the repository view. 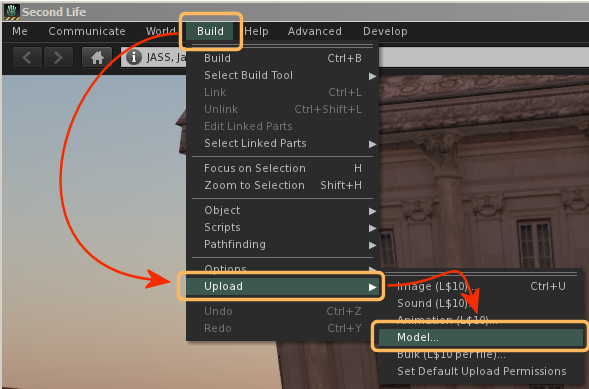 The model uploader starts in the LOD panel. Here you can define all your levels of detail or let them calculate automatically. We currently have no LOD files, so we keep this panel as it is. Note: You always can get detailed help from the help button in the upper right corner. For now you can proceed by switching to the Upload options tab. Normally the uploader will only upload the mesh, but no animation data. If you want to also import the rig data (the mesh weights), then you have to include “skin weights”. Please keep the button “Include joint positions” unchecked unless you know exactly what you do. we will get to this advanced feature later. 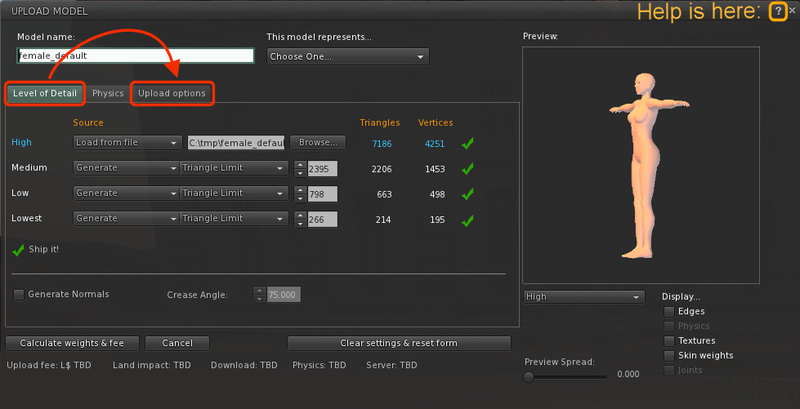 Also note that you can checkmark the “skin weights” below the Preview window to see if your mesh is properly weighted. But checking the skin weights here has no influence on the upload! This is so common mistake! If you ever are “sure that your mesh is weighted” but remains stiff when worn, then there is a good chance that you forgot to enable “Include skin weights” on the left side!